"Computed tomography" redirects here. For non-medical computed tomography, see industrial computed tomography scanning. For non-X-ray tomography, see Tomography. A CT scan, also known as computed tomography scan, and formerly known as a computerized axial tomography scan or CAT scan, makes use of computer-processed combinations of many X-ray measurements taken from different angles to produce cross-sectional (tomographic) images (virtual "slices") of specific areas of a scanned object, allowing the user to see inside the object without cutting. Digital geometry processing is used to further generate a three-dimensional volume of the inside of the object from a large series of two-dimensional radiographic images taken around a single axis of rotation. Medical imaging is the most common application of X-ray CT. Its cross-sectional images are used for diagnostic and therapeutic purposes in various medical disciplines. The rest of this article discusses medical-imaging X-ray CT; industrial applications of X-ray CT are discussed at industrial computed tomography scanning. The term "computed tomography" (CT) is often used to refer to X-ray CT, because it is the most commonly known form. But, many other types of CT exist, such as positron emission tomography (PET) and single-photon emission computed tomography (SPECT). X-ray tomography, a predecessor of CT, is one form of radiography, along with many other forms of tomographic and non-tomographic radiography. CT produces data that can be manipulated in order to demonstrate various bodily structures based on their ability to absorb the X-ray beam. Although, historically, the images generated were in the axial or transverse plane, perpendicular to the long axis of the body, modern scanners allow this volume of data to be reformatted in various planes or even as volumetric (3D) representations of structures. Although most common in medicine, CT is also used in other fields, such as nondestructive materials testing. Another example is archaeological uses such as imaging the contents of sarcophagi or ceramics. Individuals responsible for performing CT exams are called radiographers or radiologic technologists. Use of CT has increased dramatically over the last two decades in many countries. An estimated 72 million scans were performed in the United States in 2007 and more than 80 million a year in 2015. One study estimated that as many as 0.4% of current cancers in the United States are due to CTs performed in the past and that this may increase to as high as 1.5 to 2% with 2007 rates of CT use; however, this estimate is disputed, as there is not a consensus about the existence of damage from low levels of radiation. Lower radiation doses are often used in many areas, such as in the investigation of renal colic. Side effects from intravenous contrast used in some types of studies include the possibility of exacerbating kidney problems in the setting of pre-existing kidney disease. Since its introduction in the 1970s, CT has become an important tool in medical imaging to supplement X-rays and medical ultrasonography. It has more recently been used for preventive medicine or screening for disease, for example CT colonography for people with a high risk of colon cancer, or full-motion heart scans for people with high risk of heart disease. A number of institutions offer full-body scans for the general population although this practice goes against the advice and official position of many professional organizations in the field primarily due to the radiation dose applied. Computed tomography of human brain, from base of the skull to top. Taken with intravenous contrast medium. 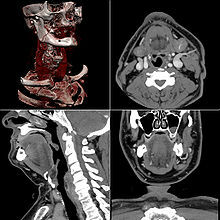 CT scanning of the head is typically used to detect infarction, tumors, calcifications, haemorrhage and bone trauma. Of the above, hypodense (dark) structures can indicate edema and infarction, hyperdense (bright) structures indicate calcifications and haemorrhage and bone trauma can be seen as disjunction in bone windows. Tumors can be detected by the swelling and anatomical distortion they cause, or by surrounding edema. Ambulances equipped with small bore multi-sliced CT scanners respond to cases involving stroke or head trauma. CT scanning of the head is also used in CT-guided stereotactic surgery and radiosurgery for treatment of intracranial tumors, arteriovenous malformations and other surgically treatable conditions using a device known as the N-localizer. Magnetic resonance imaging (MRI) of the head provides superior information as compared to CT scans when seeking information about headache to confirm a diagnosis of neoplasm, vascular disease, posterior cranial fossa lesions, cervicomedullary lesions, or intracranial pressure disorders. It also does not carry the risks of exposing the patient to ionizing radiation. CT scans may be used to diagnose headache when neuroimaging is indicated and MRI is not available, or in emergency settings when hemorrhage, stroke, or traumatic brain injury are suspected. Even in emergency situations, when a head injury is minor as determined by a physician's evaluation and based on established guidelines, CT of the head should be avoided for adults and delayed pending clinical observation in the emergency department for children. High-resolution computed tomographs of a normal thorax, taken in the axial, coronal and sagittal planes, respectively. CT scan can be used for detecting both acute and chronic changes in the lung parenchyma, that is, the internals of the lungs. It is particularly relevant here because normal two-dimensional X-rays do not show such defects. A variety of techniques are used, depending on the suspected abnormality. For evaluation of chronic interstitial processes (emphysema, fibrosis, and so forth), thin sections with high spatial frequency reconstructions are used; often scans are performed both in inspiration and expiration. This special technique is called high resolution CT. Therefore, it produces a sampling of the lung and not continuous images. Bronchial wall thickness (T) and diameter (D). Bronchial wall thickening can be seen on lung CTs, and generally (but not always) implies inflammation of the bronchi. Normally, the ratio of the bronchial wall thickness and the bronchial diameter is between 0.17 and 0.23. An incidentally found nodule in the absence of symptoms (sometimes referred to as an incidentaloma) may raise concerns that it might represent a tumor, either benign or malignant. Perhaps persuaded by fear, patients and doctors sometimes agree to an intensive schedule of CT scans, sometimes up to every three months and beyond the recommended guidelines, in an attempt to do surveillance on the nodules. However, established guidelines advise that patients without a prior history of cancer and whose solid nodules have not grown over a two-year period are unlikely to have any malignant cancer. For this reason, and because no research provides supporting evidence that intensive surveillance gives better outcomes, and because of risks associated with having CT scans, patients should not receive CT screening in excess of those recommended by established guidelines. Computed tomography angiography (CTA) is contrast CT to visualize arterial and venous vessels throughout the body. This ranges from arteries serving the brain to those bringing blood to the lungs, kidneys, arms and legs. An example of this type of exam is CT pulmonary angiogram (CTPA) used to diagnose pulmonary embolism (PE). It employs computed tomography and an iodine based contrast agent to obtain an image of the pulmonary arteries. A CT scan of the heart is performed to gain knowledge about cardiac or coronary anatomy. Traditionally, cardiac CT scans are used to detect, diagnose or follow up coronary artery disease. More recently CT has played a key role in the fast evolving field of transcatheter structural heart interventions, more specifically in the transcatheter repair and replacement of heart valves. Coronary CT angiography (CTA): the use of CT to assess the coronary arteries of the heart. The subject receives an intravenous injection of radiocontrast and then the heart is scanned using a high speed CT scanner, allowing radiologists to assess the extent of occlusion in the coronary arteries, usually in order to diagnose coronary artery disease. Coronary CT calcium scan: also used for the assessment of severity of coronary artery disease. Specifically, it looks for calcium deposits in the coronary arteries that can narrow arteries and increase the risk of heart attack. A typical coronary CT calcium scan is done without the use of radiocontrast, but it can possibly be done from contrast-enhanced images as well. To better visualize the anatomy, post-processing of the images is common. Most common are multiplanar reconstructions (MPR) and volume rendering. For more complex anatomies and procedures, such as heart valve interventions, a true 3D reconstruction or a 3D print is created based on these CT images to gain a deeper understanding. CT scan of a normal abdomen and pelvis, taken in the axial, coronal and sagittal planes, respectively. 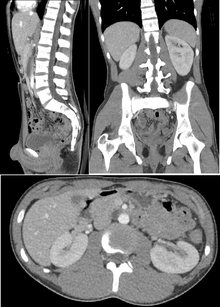 CT is an accurate technique for diagnosis of abdominal diseases. Its uses include diagnosis and staging of cancer, as well as follow up after cancer treatment to assess response. It is commonly used to investigate acute abdominal pain. For the axial skeleton and extremities, CT is often used to image complex fractures, especially ones around joints, because of its ability to reconstruct the area of interest in multiple planes. Fractures, ligamentous injuries and dislocations can easily be recognised with a 0.2 mm resolution. With modern Dual-energy CT scanners, new areas of use have been established, such as aiding in the diagnosis of gout. There are several advantages that CT has over traditional 2D medical radiography. First, CT completely eliminates the superimposition of images of structures outside the area of interest. Second, because of the inherent high-contrast resolution of CT, differences between tissues that differ in physical density by less than 1% can be distinguished. Finally, data from a single CT imaging procedure consisting of either multiple contiguous or one helical scan can be viewed as images in the axial, coronal, or sagittal planes, depending on the diagnostic task. This is referred to as multiplanar reformatted imaging. CT is regarded as a moderate- to high-radiation diagnostic technique. The improved resolution of CT has permitted the development of new investigations, which may have advantages; compared to conventional radiography, for example, CT angiography avoids the invasive insertion of a catheter. CT colonography (also known as virtual colonoscopy or VC for short) is far more accurate than a barium enema for detection of tumors, and uses a lower radiation dose. CT VC is increasingly being used in the UK and US as a screening test for colon polyps and colon cancer and can negate the need for a colonoscopy in some cases. The radiation dose for a particular study depends on multiple factors: volume scanned, patient build, number and type of scan sequences, and desired resolution and image quality. In addition, two helical CT scanning parameters that can be adjusted easily and that have a profound effect on radiation dose are tube current and pitch. Computed tomography (CT) scan has been shown to be more accurate than radiographs in evaluating anterior interbody fusion but may still over-read the extent of fusion. The radiation used in CT scans can damage body cells, including DNA molecules, which can lead to radiation-induced cancer. The radiation doses received from CT scans is variable. Compared to the lowest dose x-ray techniques, CT scans can have 100 to 1,000 times higher dose than conventional X-rays. However, a lumbar spine x-ray has a similar dose as a head CT. Articles in the media often exaggerate the relative dose of CT by comparing the lowest-dose x-ray techniques (chest x-ray) with the highest-dose CT techniques. In general, the radiation dose associated with a routine abdominal CT has a radiation dose similar to 3 years average background radiation (from cosmic radiation). Some experts note that CT scans are known to be "overused," and "there is distressingly little evidence of better health outcomes associated with the current high rate of scans." Early estimates of harm from CT are partly based on similar radiation exposures experienced by those present during the atomic bomb explosions in Japan after the Second World War and those of nuclear industry workers. Some experts project that in the future, between three and five percent of all cancers would result from medical imaging. An Australian study of 10.9 million people reported that the increased incidence of cancer after CT scan exposure in this cohort was mostly due to irradiation. In this group one in every 1800 CT scans was followed by an excess cancer. If the lifetime risk of developing cancer is 40% then the absolute risk rises to 40.05% after a CT. Some studies have shown that publications indicating an increased risk of cancer from typical doses of body CT scans are plagued with serious methodological limitations and several highly improbable results, concluding that no evidence indicates such low doses cause any long-term harm. A person's age plays a significant role in the subsequent risk of cancer. Estimated lifetime cancer mortality risks from an abdominal CT of a 1-year-old is 0.1% or 1:1000 scans. The risk for someone who is 40 years old is half that of someone who is 20 years old with substantially less risk in the elderly. The International Commission on Radiological Protection estimates that the risk to a fetus being exposed to 10 mGy (a unit of radiation exposure, see Gray (unit)) increases the rate of cancer before 20 years of age from 0.03% to 0.04% (for reference a CT pulmonary angiogram exposes a fetus to 4 mGy). A 2012 review did not find an association between medical radiation and cancer risk in children noting however the existence of limitations in the evidences over which the review is based. CT scans can be performed with different settings for lower exposure in children with most manufacturers of CT scans as of 2007 having this function built in. Furthermore, certain conditions can require children to be exposed to multiple CT scans. Studies support informing parents of the risks of pediatric CT scanning. In the United States half of CT scans are contrast CTs using intravenously injected radiocontrast agents. The most common reactions from these agents are mild, including nausea, vomiting and an itching rash; however, more severe reactions may occur. Overall reactions occur in 1 to 3% with nonionic contrast and 4 to 12% of people with ionic contrast. Skin rashes may appear within a week to 3% of people. The old radiocontrast agents caused anaphylaxis in 1% of cases while the newer, lower-osmolar agents cause reactions in 0.01–0.04% of cases. Death occurs in about two to 30 people per 1,000,000 administrations, with newer agents being safer. There is a higher risk of mortality in those who are female, elderly or in poor health, usually secondary to either anaphylaxis or acute renal failure. The contrast agent may induce contrast-induced nephropathy. This occurs in 2 to 7% of people who receive these agents, with greater risk in those who have preexisting renal insufficiency, preexisting diabetes, or reduced intravascular volume. People with mild kidney impairment are usually advised to ensure full hydration for several hours before and after the injection. For moderate kidney failure, the use of iodinated contrast should be avoided; this may mean using an alternative technique instead of CT. Those with severe renal failure requiring dialysis require less strict precautions, as their kidneys have so little function remaining that any further damage would not be noticeable and the dialysis will remove the contrast agent; it is normally recommended, however, to arrange dialysis as soon as possible following contrast administration to minimize any adverse effects of the contrast. In addition to the use of intravenous contrast, orally administered contrast agents are frequently used when examining the abdomen. These are frequently the same as the intravenous contrast agents, merely diluted to approximately 10% of the concentration. However, oral alternatives to iodinated contrast exist, such as very dilute (0.5–1% w/v) barium sulfate suspensions. Dilute barium sulfate has the advantage that it does not cause allergic-type reactions or kidney failure, but cannot be used in patients with suspected bowel perforation or suspected bowel injury, as leakage of barium sulfate from damaged bowel can cause fatal peritonitis. Left image is a sinogram which is a graphic representation of the raw data obtained from a CT scan. At right is an image sample derived from the raw data. Computed tomography operates by using an X-ray generator that rotates around the object; X-ray detectors are positioned on the opposite side of the circle from the X-ray source. A visual representation of the raw data obtained is called a sinogram, yet it is not sufficient for interpretation. Once the scan data has been acquired, the data must be processed using a form of tomographic reconstruction, which produces a series of cross-sectional images. Pixels in an image obtained by CT scanning are displayed in terms of relative radiodensity. The pixel itself is displayed according to the mean attenuation of the tissue(s) that it corresponds to on a scale from +3071 (most attenuating) to −1024 (least attenuating) on the Hounsfield scale. Pixel is a two dimensional unit based on the matrix size and the field of view. When the CT slice thickness is also factored in, the unit is known as a Voxel, which is a three-dimensional unit. The phenomenon that one part of the detector cannot differentiate between different tissues is called the "Partial Volume Effect". That means that a big amount of cartilage and a thin layer of compact bone can cause the same attenuation in a voxel as hyperdense cartilage alone. Water has an attenuation of 0 Hounsfield units (HU), while air is −1000 HU, cancellous bone is typically +400 HU, cranial bone can reach 2000 HU or more (os temporale) and can cause artifacts. The attenuation of metallic implants depends on atomic number of the element used: Titanium usually has an amount of +1000 HU, iron steel can completely extinguish the X-ray and is, therefore, responsible for well-known line-artifacts in computed tomograms. Artifacts are caused by abrupt transitions between low- and high-density materials, which results in data values that exceed the dynamic range of the processing electronics. Two-dimensional CT images are conventionally rendered so that the view is as though looking up at it from the patient's feet. Hence, the left side of the image is to the patient's right and vice versa, while anterior in the image also is the patient's anterior and vice versa. This left-right interchange corresponds to the view that physicians generally have in reality when positioned in front of patients. CT data sets have a very high dynamic range which must be reduced for display or printing. This is typically done via a process of "windowing", which maps a range (the "window") of pixel values to a grayscale ramp. For example, CT images of the brain are commonly viewed with a window extending from 0 HU to 80 HU. Pixel values of 0 and lower, are displayed as black; values of 80 and higher are displayed as white; values within the window are displayed as a grey intensity proportional to position within the window. The window used for display must be matched to the X-ray density of the object of interest, in order to optimize the visible detail. Contrast media used for X-ray CT, as well as for plain film X-ray, are called radiocontrasts. Radiocontrasts for X-ray CT are, in general, iodine-based. This is useful to highlight structures such as blood vessels that otherwise would be difficult to delineate from their surroundings. Using contrast material can also help to obtain functional information about tissues. Often, images are taken both with and without radiocontrast. The table reports average radiation exposures, however, there can be a wide variation in radiation doses between similar scan types, where the highest dose could be as much as 22 times higher than the lowest dose. A typical plain film X-ray involves radiation dose of 0.01 to 0.15 mGy, while a typical CT can involve 10–20 mGy for specific organs, and can go up to 80 mGy for certain specialized CT scans. For purposes of comparison, the world average dose rate from naturally occurring sources of background radiation is 2.4 mSv per year, equal for practical purposes in this application to 2.4 mGy per year. While there is some variation, most people (99%) received less than 7 mSv per year as background radiation. Medical imaging as of 2007 accounted for half of the radiation exposure of those in the United States with CT scans making up two thirds of this amount. In the United Kingdom it accounts for 15% of radiation exposure. The average radiation dose from medical sources is ≈0.6 mSv per person globally as of 2007. Those in the nuclear industry in the United States are limited to doses of 50 mSv a year and 100 mSv every 5 years. Lead is the main material used by radiography personnel for shielding against scattered X-rays. The radiation dose reported in the gray or mGy unit is proportional to the amount of energy that the irradiated body part is expected to absorb, and the physical effect (such as DNA double strand breaks) on the cells' chemical bonds by X-ray radiation is proportional to that energy. The sievert unit is used in the report of the effective dose. The sievert unit, in the context of CT scans, does not correspond to the actual radiation dose that the scanned body part absorbs but to another radiation dose of another scenario, the whole body absorbing the other radiation dose and the other radiation dose being of a magnitude, estimated to have the same probability to induce cancer as the CT scan. Thus, as is shown in the table above, the actual radiation that is absorbed by a scanned body part is often much larger than the effective dose suggests. 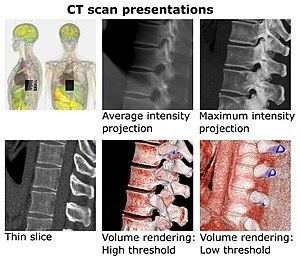 A specific measure, termed the computed tomography dose index (CTDI), is commonly used as an estimate of the radiation absorbed dose for tissue within the scan region, and is automatically computed by medical CT scanners. The equivalent dose is the effective dose of a case, in which the whole body would actually absorb the same radiation dose, and the sievert unit is used in its report. In the case of non-uniform radiation, or radiation given to only part of the body, which is common for CT examinations, using the local equivalent dose alone would overstate the biological risks to the entire organism. stochastic effects, i.e., cancer and heritable effects involving either cancer development in exposed individuals owing to mutation of somatic cells or heritable disease in their offspring owing to mutation of reproductive (germ) cells. The added lifetime risk of developing cancer by a single abdominal CT of 8 mSv is estimated to be 0.05%, or 1 one in 2,000. Because of increased susceptibility of fetuses to radiation exposure, the radiation dosage of a CT scan is an important consideration in the choice of medical imaging in pregnancy. In October, 2009, the US Food and Drug Administration (FDA) initiated an investigation of brain perfusion CT (PCT) scans, based on radiation burns caused by incorrect settings at one particular facility for this particular type of CT scan. Over 256 patients over an 18-month period were exposed, over 40% lost patches of hair, and prompted the editorial to call for increased CT quality assurance programs, while also noting that "while unnecessary radiation exposure should be avoided, a medically needed CT scan obtained with appropriate acquisition parameter has benefits that outweigh the radiation risks." Similar problems have been reported at other centers. These incidents are believed to be due to human error. In response to increased concern by the public and the ongoing progress of best practices, The Alliance for Radiation Safety in Pediatric Imaging was formed within the Society for Pediatric Radiology. In concert with The American Society of Radiologic Technologists, The American College of Radiology and The American Association of Physicists in Medicine, the Society for Pediatric Radiology developed and launched the Image Gently Campaign which is designed to maintain high quality imaging studies while using the lowest doses and best radiation safety practices available on pediatric patients. This initiative has been endorsed and applied by a growing list of various professional medical organizations around the world and has received support and assistance from companies that manufacture equipment used in Radiology. Following upon the success of the Image Gently campaign, the American College of Radiology, the Radiological Society of North America, the American Association of Physicists in Medicine and the American Society of Radiologic Technologists have launched a similar campaign to address this issue in the adult population called Image Wisely. The World Health Organization and International Atomic Energy Agency (IAEA) of the United Nations have also been working in this area and have ongoing projects designed to broaden best practices and lower patient radiation dose. Use of CT has increased dramatically over the last two decades. An estimated 72 million scans were performed in the United States in 2007. Of these, six to eleven percent are done in children, an increase of seven to eightfold from 1980. Similar increases have been seen in Europe and Asia. In Calgary, Canada 12.1% of people who present to the emergency with an urgent complaint received a CT scan, most commonly either of the head or of the abdomen. The percentage who received CT, however, varied markedly by the emergency physician who saw them from 1.8% to 25%. In the emergency department in the United States, CT or MRI imaging is done in 15% of people who present with injuries as of 2007 (up from 6% in 1998). The increased use of CT scans has been the greatest in two fields: screening of adults (screening CT of the lung in smokers, virtual colonoscopy, CT cardiac screening, and whole-body CT in asymptomatic patients) and CT imaging of children. Shortening of the scanning time to around 1 second, eliminating the strict need for the subject to remain still or be sedated, is one of the main reasons for the large increase in the pediatric population (especially for the diagnosis of appendicitis). As of 2007 in the United States a proportion of CT scans are performed unnecessarily. Some estimates place this number at 30%. There are a number of reasons for this including: legal concerns, financial incentives, and desire by the public. For example, some healthy people avidly pay to receive full-body CT scans as screening, but it is not at all clear that the benefits outweigh the risks and costs, because deciding whether and how to treat incidentalomas is fraught with complexity, radiation exposure is cumulative and not negligible, and the money for the scans involves opportunity cost (it may have been more effectively spent on more targeted screening or other health care strategies). CT creates a volume of voxels. - Volume rendering by high and low threshold for radiodensity. Thin slice. This is generally regarded as planes representing a thickness of less than 3 mm. Technically, all volume renderings become projections when viewed on a 2-dimensional display, making the distinction between projections and volume renderings a bit vague. Still, the epitomes of volume rendering models feature a mix of for example coloring and shading in order to create realistic and observable representations. Two-dimensional CT images are conventionally rendered so that the view is as though looking up at it from the patient's feet. Hence, the left side of the image is to the patient's right and vice versa, while anterior in the image also is the patient's anterior and vice versa. This left-right interchange corresponds to the view that physicians generally have in reality when positioned in front of patients. Pixels in an image obtained by CT scanning are displayed in terms of relative radiodensity. The pixel itself is displayed according to the mean attenuation of the tissue(s) that it corresponds to on a scale from +3071 (most attenuating) to −1024 (least attenuating) on the Hounsfield scale. Pixel is a two dimensional unit based on the matrix size and the field of view. When the CT slice thickness is also factored in, the unit is known as a Voxel, which is a three-dimensional unit. The phenomenon that one part of the detector cannot differentiate between different tissues is called the "Partial Volume Effect". That means that a big amount of cartilage and a thin layer of compact bone can cause the same attenuation in a voxel as hyperdense cartilage alone. Water has an attenuation of 0 Hounsfield units (HU), while air is −1000 HU, cancellous bone is typically +400 HU, cranial bone can reach 2000 HU or more (os temporale) and can cause artifacts. The attenuation of metallic implants depends on atomic number of the element used: Titanium usually has an amount of +1000 HU, iron steel can completely extinguish the X-ray and is, therefore, responsible for well-known line-artifacts in computed tomograms. Artifacts are caused by abrupt transitions between low- and high-density materials, which results in data values that exceed the dynamic range of the processing electronics. CT data sets have a very high dynamic range which must be reduced for display or printing. This is typically done via a process of "windowing", which maps a range (the "window") of pixel values to a grayscale ramp. For example, CT images of the brain are commonly viewed with a window extending from 0 HU to 80 HU. Pixel values of 0 and lower, are displayed as black; values of 80 and higher are displayed as white; values within the window are displayed as a grey intensity proportional to position within the window. The window used for display must be matched to the X-ray density of the object of interest, in order to optimize the visible detail. Typical screen layout for diagnostic software, showing one volume rendering (VR) and multiplanar view of three thin slices. Multiplanar reconstruction (MPR) is the creation of slices in more anatomical planes than the one (usually transverse) used for initial tomography acquisition. It can be used for thin slices as well as projections. Multiplanar reconstruction is feasible because contemporary CT scanners offer isotropic or near isotropic resolution. MPR is frequently used for examining the spine. Axial images through the spine will only show one vertebral body at a time and cannot reliably show the intervertebral discs. By reformatting the volume, it becomes much easier to visualise the position of one vertebral body in relation to the others. Modern software allows reconstruction in non-orthogonal (oblique) planes so that the optimal plane can be chosen to display an anatomical structure. This may be particularly useful for visualization of the structure of the bronchi as these do not lie orthogonal to the direction of the scan. For vascular imaging, curved-plane reconstruction can be performed. This allows bends in a vessel to be "straightened" so that the entire length can be visualised on one image, or a short series of images. Once a vessel has been "straightened" in this way, quantitative measurements of length and cross sectional area can be made, so that surgery or interventional treatment can be planned. The average attenuation of each voxel is displayed. Image will get smoother as slice thickness increases. Will look more and more similar to conventional projectional radiography as slice thickness increases. The voxel with the highest attenuation is displyed. Therefore, high attenuating structures such as blood vessels filled with contrast media is enhanced. May be used for angiographic studies and identification of pulmonary nodules. The voxel with the lowest attenuation is displayed. Therefore, low attenuating structures such air spaces is enhanced. May be used for assessing the lung parenchyma. A threshold value of radiodensity is set by the operator (e.g., a level that corresponds to bone). From this, a three-dimensional model can be constructed using edge detection image processing algorithms and displayed on screen. Multiple models can be constructed from various thresholds, allowing different colors to represent each anatomical component such as bone, muscle, and cartilage. However, the interior structure of each element is not visible in this mode of operation. Surface rendering is limited in that it will display only surfaces that meet a threshold density, and will display only the surface that is closest to the imaginary viewer. In volume rendering, transparency, colors and shading are used to allow a better representation of the volume to be shown in a single image. For example, the bones of the pelvis could be displayed as semi-transparent, so that, even at an oblique angle, one part of the image does not conceal another. Reduced size 3D printed human skull from computed tomography data. Streaks are often seen around materials that block most X-rays, such as metal or bone. Numerous factors contribute to these streaks: undersampling, photon starvation, motion, beam hardening, and Compton scatter. This type of artifact commonly occurs in the posterior fossa of the brain, or if there are metal implants. The streaks can be reduced using newer reconstruction techniques or approaches such as metal artifact reduction (MAR). MAR techniques include spectral imaging, where CT images are taken with photons of different energy levels, and then synthesized into monochromatic images with special software such as GSI (Gemstone Spectral Imaging). This appears as "blurring" of edges. It is due to the scanner being unable to differentiate between a small amount of high-density material (e.g., bone) and a larger amount of lower density (e.g., cartilage). The reconstruction assumes that the X-ray attenuation within each voxel is homogenous; this may not be the case at sharp edges. This is most commonly seen in the z-direction, due to the conventional use of highly anisotropic voxels, which have a much lower out-of-plane resolution, than in-plane resolution. This can be partially overcome by scanning using thinner slices, or an isotropic acquisition on a modern scanner. Probably the most common mechanical artifact, the image of one or many "rings" appears within an image. They are usually caused by the variations in the response from individual elements in a two dimensional X-ray detector due to defect or miscalibration. Ring artefacts can largely be reduced by intensity normalization, also referred to as flat field correction. Remaining rings can be suppressed by a transformation to polar space, where they become linear stripes. A comparative evaluation of ring artefact reduction on X-ray tomography images showed that the method of Sijbers and Postnov  can effectively suppress ring artefacts. This appears as grain on the image and is caused by a low signal to noise ratio. This occurs more commonly when a thin slice thickness is used. It can also occur when the power supplied to the X-ray tube is insufficient to penetrate the anatomy. Streaking appearances can occur when the detectors intersect the reconstruction plane. This can be reduced with filters or a reduction in pitch. This can give a "cupped appearance" when grayscale is visualized as height. It occurs because conventional sources, like X-ray tubes emit a polychromatic spectrum. Photons of higher photon energy levels are typically attenuated less. Because of this, the mean energy of the spectrum increases when passing the object, often described as getting "harder". This leads to an effect increasingly underestimating material thickness, if not corrected. Many algorithms exist to correct for this artifact. They can be divided in mono- and multi-material methods. An important issue within radiology today is how to reduce the radiation dose during CT examinations without compromising the image quality. In general, higher radiation doses result in higher-resolution images, while lower doses lead to increased image noise and unsharp images. However, increased dosage raises the adverse side effects, including the risk of radiation-induced cancer – a four-phase abdominal CT gives the same radiation dose as 300 chest X-rays (See the Scan dose section). Several methods that can reduce the exposure to ionizing radiation during a CT scan exist. New software technology can significantly reduce the required radiation dose. New iterative tomographic reconstruction algorithms (e.g., iterative Sparse Asymptotic Minimum Variance) could offer superresolution without requiring higher radiation dose. Individualize the examination and adjust the radiation dose to the body type and body organ examined. Different body types and organs require different amounts of radiation. Prior to every CT examination, evaluate the appropriateness of the exam whether it is motivated or if another type of examination is more suitable. Higher resolution is not always suitable for any given scenario, such as detection of small pulmonary masses. Industrial CT Scanning (industrial computed tomography) is a process which utilizes X-ray equipment to produce 3D representations of components both externally and internally. Industrial CT scanning has been utilized in many areas of industry for internal inspection of components. Some of the key uses for CT scanning have been flaw detection, failure analysis, metrology, assembly analysis, image-based finite element methods and reverse engineering applications. CT scanning is also employed in the imaging and conservation of museum artifacts. CT scanning has also found an application in transport security (predominantly airport security where it is currently used in a materials analysis context for explosives detection CTX (explosive-detection device) and is also under consideration for automated baggage/parcel security scanning using computer vision based object recognition algorithms that target the detection of specific threat items based on 3D appearance (e.g. guns, knives, liquid containers). The history of X-ray computed tomography goes back to at least 1917 with the mathematical theory of the Radon transform. In October 1963, Oldendorf received a U.S. patent for a "radiant energy apparatus for investigating selected areas of interior objects obscured by dense material". The first commercially viable CT scanner was invented by Sir Godfrey Hounsfield in 1972. The word "tomography" is derived from the Greek tome (slice) and graphein (to write). Computed tomography was originally known as the "EMI scan" as it was developed in the early 1970s at a research branch of EMI, a company best known today for its music and recording business. It was later known as computed axial tomography (CAT or CT scan) and body section röntgenography. 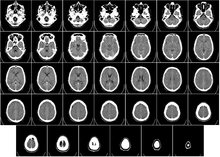 Although the term "computed tomography" could be used to describe positron emission tomography or single photon emission computed tomography (SPECT), in practice it usually refers to the computation of tomography from X-ray images, especially in older medical literature and smaller medical facilities. In MeSH, "computed axial tomography" was used from 1977 to 1979, but the current indexing explicitly includes "X-ray" in the title. The term sinogram was introduced by Paul Edholm and Bertil Jacobson in 1975. Spinning tube, commonly called spiral CT, or helical CT is an imaging technique in which an entire X-ray tube is spun around the central axis of the area being scanned. These are the dominant type of scanners on the market because they have been manufactured longer and offer lower cost of production and purchase. The main limitation of this type is the bulk and inertia of the equipment (X-ray tube assembly and detector array on the opposite side of the circle) which limits the speed at which the equipment can spin. Some designs use two X-ray sources and detector arrays offset by an angle, as a technique to improve temporal resolution. Electron beam tomography (EBT) is a specific form of CT in which a large enough X-ray tube is constructed so that only the path of the electrons, travelling between the cathode and anode of the X-ray tube, are spun using deflection coils. This type had a major advantage since sweep speeds can be much faster, allowing for less blurry imaging of moving structures, such as the heart and arteries. Fewer scanners of this design have been produced when compared with spinning tube types, mainly due to the higher cost associated with building a much larger X-ray tube and detector array and limited anatomical coverage. Only one manufacturer (Imatron, later acquired by General Electric) ever produced scanners of this design. Production ceased in early 2006. In multislice computed tomography (MSCT) or multidetector computed tomography (MDCT), a higher number of tomographic slices allow for higher-resolution imaging. Modern CT machines typically generate 64-640 slices per scan. Photon counting computed tomography is a CT technique currently under development. Typical CT scanners use energy integrating detectors; photons are measured as a voltage on a capacitor which is proportional to the x-rays detected. However, this technique is susceptible to noise and other factors which can affect the linearity of the voltage to x-ray intensity relationship. Photon counting detectors (PCDs) are still affected by noise but it does not change the measured counts of photons. PCDs have several potential advantages including improving signal (and contrast) to noise ratios, reducing doses, improving spatial resolution and, through use of several energies, distinguishing multiple contrast agents. PCDs have only recently become feasible in CT scanners due to improvements in detector technologies that can cope with the volume and rate of data required. As of February 2016 photon counting CT is in use at three sites. Some early research has found the dose reduction potential of photon counting CT for breast imaging to be very promising. ^ "CT scan – Mayo Clinic". mayoclinic.org. Archived from the original on 15 October 2016. Retrieved 20 October 2016. ^ "CT Scan (CAT Scan, Computerized Tomography) Imaging Procedure". MedicineNet. Retrieved 2018-11-29. ^ "computed tomography – Definition from the Merriam-Webster Online Dictionary". Archived from the original on 19 September 2011. Retrieved 18 August 2009. ^ Advanced documentation methods in studying Corinthian black-figure vase painting on YouTube showing a Computed Tomography scan and rollout of the aryballos No. G26, archaeological collection, Graz University. The video was rendered using the GigaMesh Software Framework, cf. doi:10.11588/heidok.00025189. ^ "Patient Page | ARRT – The American Registry of Radiologic Technologists". ARRT. Archived from the original on 9 November 2014. Retrieved 5 January 2014. ^ "Individual State Licensure Information". American Society of Radiologic Technologists. Archived from the original on 18 July 2013. Retrieved 19 July 2013. ^ a b Smith-Bindman R, Lipson J, Marcus R, Kim KP, Mahesh M, Gould R, Berrington de González A, Miglioretti DL (December 2009). "Radiation dose associated with common computed tomography examinations and the associated lifetime attributable risk of cancer". Arch. Intern. Med. 169 (22): 2078–86. doi:10.1001/archinternmed.2009.427. PMC 4635397. PMID 20008690. ^ a b Berrington de González A, Mahesh M, Kim KP, Bhargavan M, Lewis R, Mettler F, Land C (December 2009). "Projected cancer risks from computed tomographic scans performed in the United States in 2007". Arch. Intern. Med. 169 (22): 2071–7. doi:10.1001/archinternmed.2009.440. PMC 6276814. PMID 20008689. ^ "Dangers of CT Scans and X-Rays - Consumer Reports". Retrieved 16 May 2018. ^ a b c d e f g h Brenner DJ, Hall EJ (November 2007). "Computed tomography – an increasing source of radiation exposure" (PDF). N. Engl. J. Med. 357 (22): 2277–84. doi:10.1056/NEJMra072149. PMID 18046031. Archived (PDF) from the original on 2016-03-04. ^ Tubiana M (February 2008). "Comment on Computed Tomography and Radiation Exposure". N. Engl. J. Med. 358 (8): 852–3. doi:10.1056/NEJMc073513. PMID 18287609. ^ Rob, S.; Bryant, T.; Wilson, I.; Somani, B.K. (2017). "Ultra-low-dose, low-dose, and standard-dose CT of the kidney, ureters, and bladder: is there a difference? Results from a systematic review of the literature". Clinical Radiology. 72 (1): 11–15. doi:10.1016/j.crad.2016.10.005. PMID 27810168. ^ a b c Hasebroock KM, Serkova NJ (April 2009). "Toxicity of MRI and CT contrast agents". Expert Opinion on Drug Metabolism & Toxicology. 5 (4): 403–16. doi:10.1517/17425250902873796. PMID 19368492. ^ "CT Screening" (PDF). hps.org. Archived from the original (PDF) on 13 October 2016. Retrieved 1 May 2018. ^ Galloway, RL Jr. (2015). "Introduction and Historical Perspectives on Image-Guided Surgery". In Golby, AJ (ed.). Image-Guided Neurosurgery. Amsterdam: Elsevier. pp. 3–4. ^ Tse, VCK; Kalani, MYS; Adler, JR (2015). "Techniques of Stereotactic Localization". In Chin, LS; Regine, WF (eds.). Principles and Practice of Stereotactic Radiosurgery. New York: Springer. p. 28. ^ Saleh, H; Kassas, B (2015). "Developing Stereotactic Frames for Cranial Treatment". In Benedict, SH; Schlesinger, DJ; Goetsch, SJ; Kavanagh, BD (eds.). Stereotactic Radiosurgery and Stereotactic Body Radiation Therapy. Boca Raton: CRC Press. pp. 156–159. ^ Khan, FR; Henderson, JM (2013). "Deep Brain Stimulation Surgical Techniques". In Lozano, AM; Hallet, M (eds.). Brain Stimulation: Handbook of Clinical Neurology. 116. Amsterdam: Elsevier. pp. 28–30. ^ Arle, J (2009). "Development of a Classic: the Todd-Wells Apparatus, the BRW, and the CRW Stereotactic Frames". In Lozano, AM; Gildenberg, PL; Tasker, RR (eds.). Textbook of Stereotactic and Functional Neurosurgery. Berlin: Springer-Verlag. pp. 456–461. ^ Brown RA, Nelson JA (June 2012). "Invention of the N-localizer for stereotactic neurosurgery and its use in the Brown-Roberts-Wells stereotactic frame". Neurosurgery. 70 (2 Supplement Operative): 173–176. doi:10.1227/NEU.0b013e318246a4f7. PMID 22186842. Health Quality, Ontario (2010). "Neuroimaging for the evaluation of chronic headaches: An evidence-based analysis". Ontario Health Technology Assessment Series. 10 (26): 1–57. PMC 3377587. PMID 23074404. Evans RW (2009). "Diagnostic Testing for Migraine and Other Primary Headaches". Neurologic Clinics. 27 (2): 393–415. doi:10.1016/j.ncl.2008.11.009. PMID 19289222. Semelka RC, Armao DM, Elias J, Huda W (2007). "Imaging strategies to reduce the risk of radiation in CT studies, including selective substitution with MRI". Journal of Magnetic Resonance Imaging. 25 (5): 900–909. doi:10.1002/jmri.20895. PMID 17457809. Brenner DJ, Hall EJ (2007). "Computed Tomography — an Increasing Source of Radiation Exposure". New England Journal of Medicine. 357 (22): 2277–2284. doi:10.1056/NEJMra072149. PMID 18046031. Jagoda AS, Bazarian JJ, Bruns JJ, Cantrill SV, Gean AD, Howard PK, Ghajar J, Riggio S, Wright DW, Wears RL, Bakshy A, Burgess P, Wald MM, Whitson RR (2008). "Clinical policy: neuroimaging and decisionmaking in adult mild traumatic brain injury in the acute setting". Ann Emerg Med. 52 (6): 714–48. doi:10.1016/j.annemergmed.2008.08.021. PMID 19027497. Stiell IG, Clement CM, Rowe BH, Schull MJ, Brison R, Cass D, Eisenhauer MA, McKnight RD, Bandiera G, Holroyd B, Lee JS, Dreyer J, Worthington JR, Reardon M, Greenberg G, Lesiuk H, MacPhail I, Wells GA (2005). "Comparison of the Canadian CT Head Rule and the New Orleans Criteria in patients with minor head injury". JAMA. 294 (12): 1511–8. doi:10.1001/jama.294.12.1511. PMC 3997198. PMID 16189364. Haydel MJ, Preston CA, Mills TJ, Luber S, Blaudeau E, DeBlieux PM (2000). "Indications for computed tomography in patients with minor head injury". N. Engl. J. Med. 343 (2): 100–5. doi:10.1056/NEJM200007133430204. PMID 10891517. Smits M, Dippel DW, de Haan GG, Dekker HM, Vos PE, Kool DR, Nederkoorn PJ, Hofman PA, Twijnstra A, Tanghe HL, Hunink MG (2005). "External validation of the Canadian CT Head Rule and the New Orleans Criteria for CT scanning in patients with minor head injury". JAMA. 294 (12): 1519–25. doi:10.1001/jama.294.12.1519. PMID 16189365. ^ Yuranga Weerakkody. "Bronchial wall thickening". Radiopaedia. Archived from the original on 2018-01-06. Retrieved 2018-01-05. ^ Page 112 Archived 2018-01-06 at the Wayback Machine in: David P. Naidich (2005). Imaging of the Airways: Functional and Radiologic Correlations. Lippincott Williams & Wilkins. ISBN 9780781757683. ^ Wiener RS, Gould MK, Woloshin S, Schwartz LM, Clark JA (2012). ""What do you mean, a spot? ": A qualitative analysis of patients' reactions to discussions with their doctors about pulmonary nodules". Chest. 143 (3): 672–677. doi:10.1378/chest.12-1095. PMC 3590883. PMID 22814873. MacMahon H, Austin JH, Gamsu G, Herold CJ, Jett JR, Naidich DP, Patz EF, Swensen SJ (2005). 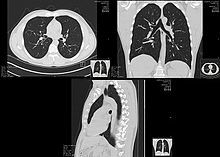 "Guidelines for Management of Small Pulmonary Nodules Detected on CT Scans: A Statement from the Fleischner Society1". Radiology. 237 (2): 395–400. doi:10.1148/radiol.2372041887. PMID 16244247. Gould MK, Fletcher J, Iannettoni MD, Lynch WR, Midthun DE, Naidich DP, Ost DE (2007). "Evaluation of Patients with Pulmonary Nodules: When is It Lung Cancer?*". Chest. 132 (3_suppl): 108S–130S. doi:10.1378/chest.07-1353. PMID 17873164. Smith-Bindman R, Lipson J, Marcus R, Kim KP, Mahesh M, Gould R, Berrington de González A, Miglioretti DL (2009). "Radiation Dose Associated with Common Computed Tomography Examinations and the Associated Lifetime Attributable Risk of Cancer". Archives of Internal Medicine. 169 (22): 2078–2086. doi:10.1001/archinternmed.2009.427. PMC 4635397. PMID 20008690. Wiener RS, Gould MK, Woloshin S, Schwartz LM, Clark JA (2012). ""What do you mean, a spot? ": A qualitative analysis of patients' reactions to discussions with their doctors about pulmonary nodules". Chest. 143 (3): 672–677. doi:10.1378/chest.12-1095. PMC 3590883. PMID 22814873. ^ "Cardiac CT Scan - NHLBI, NIH". www.nhlbi.nih.gov. Archived from the original on 2017-12-01. Retrieved 2017-11-22. ^ a b Wichmann, Julian L. "Cardiac CT | Radiology Reference Article | Radiopaedia.org". radiopaedia.org. Archived from the original on 2017-12-01. Retrieved 2017-11-22. ^ Marwan, Mohamed; Achenbach, Stephan (February 2016). "Role of Cardiac CT Before Transcatheter Aortic Valve Implantation (TAVI)". Current Cardiology Reports. 18 (2): 21. doi:10.1007/s11886-015-0696-3. ISSN 1534-3170. PMID 26820560. ^ Moss, Alastair J.; Dweck, Marc R.; Dreisbach, John G.; Williams, Michelle C.; Mak, Sze Mun; Cartlidge, Timothy; Nicol, Edward D.; Morgan-Hughes, Gareth J. (2016-11-01). "Complementary role of cardiac CT in the assessment of aortic valve replacement dysfunction". Open Heart. 3 (2): e000494. doi:10.1136/openhrt-2016-000494. ISSN 2053-3624. PMC 5093391. PMID 27843568. Archived from the original on 2017-05-03. ^ Inc., Advanced Solutions International. "Poster 31". aats.org. Archived from the original on 2017-12-01. Retrieved 2017-11-22. ^ "Heart scan (coronary calcium scan)". Mayo Clinic. Archived from the original on 5 September 2015. Retrieved 9 August 2015. ^ van der Bijl, Noortje; Joemai, Raoul M. S.; Geleijns, Jacob; Bax, Jeroen J.; Schuijf, Joanne D.; de Roos, Albert; Kroft, Lucia J. M. (2010). "Assessment of Agatston Coronary Artery Calcium Score Using Contrast-Enhanced CT Coronary Angiography". American Journal of Roentgenology. 195 (6): 1299–1305. doi:10.2214/AJR.09.3734. ISSN 0361-803X. PMID 21098187. ^ Vukicevic, Marija; Mosadegh, Bobak; Min, James K.; Little, Stephen H. (February 2017). "Cardiac 3D Printing and its Future Directions". JACC. Cardiovascular Imaging. 10 (2): 171–184. doi:10.1016/j.jcmg.2016.12.001. ISSN 1876-7591. PMC 5664227. PMID 28183437. ^ "Innovative Mitral Valve Treatment with 3D Visualization at Henry Ford". Materialise. Archived from the original on 2017-12-01. Retrieved 2017-11-22. ^ Wang, Dee Dee; Eng, Marvin; Greenbaum, Adam; Myers, Eric; Forbes, Michael; Pantelic, Milan; Song, Thomas; Nelson, Christina; Divine, George (November 2016). "Predicting LVOT Obstruction After TMVR". JACC. Cardiovascular Imaging. 9 (11): 1349–1352. doi:10.1016/j.jcmg.2016.01.017. ISSN 1876-7591. PMC 5106323. PMID 27209112. ^ Jacobs, Stephan; Grunert, Ronny; Mohr, Friedrich W.; Falk, Volkmar (February 2008). "3D-Imaging of cardiac structures using 3D heart models for planning in heart surgery: a preliminary study". Interactive Cardiovascular and Thoracic Surgery. 7 (1): 6–9. doi:10.1510/icvts.2007.156588. ISSN 1569-9285. PMID 17925319. ^ "Ankle Fractures". orthoinfo.aaos.org. American Association of Orthopedic Surgeons. Archived from the original on 30 May 2010. Retrieved 30 May 2010. ^ Buckwalter, Kenneth A.; et al. (11 September 2000). "Musculoskeletal Imaging with Multislice CT". American Journal of Roentgenology. 176 (4): 979–986. doi:10.2214/ajr.176.4.1760979. PMID 11264094. Retrieved 22 May 2010. ^ Ramon, André; Bohm-Sigrand, Amélie; Pottecher, Pierre; Richette, Pascal; Maillefert, Jean-Francis; Devilliers, Herve; Ornetti, Paul (2018-03-01). "Role of dual-energy CT in the diagnosis and follow-up of gout: systematic analysis of the literature". Clinical Rheumatology. 37 (3): 587–595. doi:10.1007/s10067-017-3976-z. ISSN 0770-3198. PMID 29350330. ^ Žabić S, Wang Q, Morton T, Brown KM (March 2013). "A low dose simulation tool for CT systems with energy integrating detectors". Medical Physics. 40 (3): 031102. Bibcode:2013MedPh..40c1102Z. doi:10.1118/1.4789628. PMID 23464282. ^ Health, Center for Devices and Radiological. "Medical X-ray Imaging - What are the Radiation Risks from CT?". www.fda.gov. Archived from the original on 5 November 2013. Retrieved 1 May 2018. ^ (ACR), Radiological Society of North America (RSNA) and American College of Radiology. "Patient Safety - Radiation Dose in X-Ray and CT Exams". radiologyinfo.org. Archived from the original on 14 March 2018. Retrieved 1 May 2018. ^ Mathews, J. D.; Forsythe, A. V.; Brady, Z.; Butler, M. W.; Goergen, S. K.; Byrnes, G. B.; Giles, G. G.; Wallace, A. B.; Anderson, P. R.; Guiver, T. A.; McGale, P.; Cain, T. M.; Dowty, J. G.; Bickerstaffe, A. C.; Darby, S. C. (2013). "Cancer risk in 680 000 people exposed to computed tomography scans in childhood or adolescence: data linkage study of 11 million Australians". BMJ. 346 (may21 1): f2360. doi:10.1136/bmj.f2360. ISSN 1756-1833. PMC 3660619. PMID 23694687. ^ Sasieni, P D; Shelton, J; Ormiston-Smith, N; Thomson, C S; Silcocks, P B (2011). "What is the lifetime risk of developing cancer? : the effect of adjusting for multiple primaries". British Journal of Cancer. 105 (3): 460–465. doi:10.1038/bjc.2011.250. ISSN 0007-0920. PMC 3172907. PMID 21772332. ^ Eckel, Laurence J.; Fletcher, Joel G.; Bushberg, Jerrold T.; McCollough, Cynthia H. (2015-10-01). "Answers to Common Questions About the Use and Safety of CT Scans". Mayo Clinic Proceedings. 90 (10): 1380–1392. doi:10.1016/j.mayocp.2015.07.011. ISSN 0025-6196. ^ "Expert opinion: Are CT scans safe?". ScienceDaily. Retrieved 2019-03-14. ^ "'No evidence that CT scans, X-rays cause cancer'". Medical News Today. Retrieved 2019-03-14. ^ a b c d e Davies, H. E.; Wathen, C. G.; Gleeson, F. V. (25 February 2011). "The risks of radiation exposure related to diagnostic imaging and how to minimise them". BMJ. 342 (feb25 1): d947. doi:10.1136/bmj.d947. PMID 21355025. ^ Baysson H, Etard C, Brisse HJ, Bernier MO (January 2012). "[Diagnostic radiation exposure in children and cancer risk: current knowledge and perspectives]". Archives de Pédiatrie. 19 (1): 64–73. doi:10.1016/j.arcped.2011.10.023. PMID 22130615. ^ a b c d Semelka RC, Armao DM, Elias J, Huda W (May 2007). "Imaging strategies to reduce the risk of radiation in CT studies, including selective substitution with MRI". J Magn Reson Imaging. 25 (5): 900–9. doi:10.1002/jmri.20895. PMID 17457809. ^ Larson DB, Rader SB, Forman HP, Fenton LZ (August 2007). "Informing parents about CT radiation exposure in children: it's OK to tell them". Am J Roentgenol. 189 (2): 271–5. doi:10.2214/AJR.07.2248. PMID 17646450. ^ a b Namasivayam S, Kalra MK, Torres WE, Small WC (Jul 2006). "Adverse reactions to intravenous iodinated contrast media: a primer for radiologists". Emergency Radiology. 12 (5): 210–5. doi:10.1007/s10140-006-0488-6. PMID 16688432. ^ a b c Christiansen C (2005-04-15). "X-ray contrast media – an overview". Toxicology. 209 (2): 185–7. doi:10.1016/j.tox.2004.12.020. PMID 15767033. ^ a b Wang H, Wang HS, Liu ZP (October 2011). "Agents that induce pseudo-allergic reaction". Drug Discov Ther. 5 (5): 211–9. doi:10.5582/ddt.2011.v5.5.211. PMID 22466368. ^ Drain KL, Volcheck GW (2001). "Preventing and managing drug-induced anaphylaxis". Drug Safety. 24 (11): 843–53. doi:10.2165/00002018-200124110-00005. PMID 11665871. ^ editor, Mariana C. Castells (2010-12-09). Anaphylaxis and hypersensitivity reactions. New York: Humana Press. p. 187. ISBN 9781603279505. ^ Jun, Kyungtaek; Yoon, Seokhwan (2017). "Alignment Solution for CT Image Reconstruction using Fixed Point and Virtual Rotation Axis". Scientific Reports. 7: 41218. arXiv:1605.04833. Bibcode:2017NatSR...741218J. doi:10.1038/srep41218. ISSN 2045-2322. PMC 5264594. PMID 28120881. ^ a b Computerized Tomography chapter Archived 2016-03-04 at the Wayback Machine at University of Connecticut Health Center. ^ Webb, W. Richard; Brant, Wiliam E.; Major, Nancy M. (2014). Fundamentals of Body CT. Elsevier Health Sciences. p. 152. ISBN 9780323263580. ^ a b c Cuttler JM, Pollycove M (2009). "Nuclear energy and health: and the benefits of low-dose radiation hormesis". Dose Response. 7 (1): 52–89. doi:10.2203/dose-response.08-024.Cuttler. PMC 2664640. PMID 19343116. ^ a b "What are the Radiation Risks from CT?". Food and Drug Administration. 2009. Archived from the original on 2013-11-05. ^ a b c d e f Hall EJ, Brenner DJ (May 2008). "Cancer risks from diagnostic radiology". The British Journal of Radiology. 81 (965): 362–78. doi:10.1259/bjr/01948454. PMID 18440940. ^ Polo SE, Jackson SP (March 2011). "Dynamics of DNA damage response proteins at DNA breaks: a focus on protein modifications". Genes Dev. 25 (5): 409–33. doi:10.1101/gad.2021311. PMC 3049283. PMID 21363960. ^ The Measurement, Reporting, and Management of Radiation Dose in CT Archived 2017-06-23 at the Wayback Machine "It is a single dose parameter that reflects the risk of a nonuniform exposure in terms of an equivalent whole-body exposure." ^ Hill B, Venning AJ, Baldock C (2005). "A preliminary study of the novel application of normoxic polymer gel dosimeters for the measurement of CTDI on diagnostic X-ray CT scanners". Medical Physics. 32 (6): 1589–1597. Bibcode:2005MedPh..32.1589H. doi:10.1118/1.1925181. PMID 16013718. ^ "Do CT scans cause cancer?". Harvard Medical School. March 2013. Archived from the original on 2017-12-09. Retrieved 2017-12-09. ^ Wintermark M, Lev MH (January 2010). "FDA investigates the safety of brain perfusion CT". AJNR Am J Neuroradiol. 31 (1): 2–3. doi:10.3174/ajnr.A1967. PMID 19892810. ^ "Image Gently". The Alliance for Radiation Safety in Pediatric Imaging. Archived from the original on 9 June 2013. Retrieved 19 July 2013. ^ "Image Wisely". Joint Task Force on Adult Radiation Protection. Archived from the original on 21 July 2013. Retrieved 19 July 2013. ^ "Optimal levels of radiation for patients". World Health Organization. Archived from the original on 25 May 2013. Retrieved 19 July 2013. ^ "Global Initiative on Radiation Safety in Healthcare Settings" (PDF). World Health Organization. Archived (PDF) from the original on 29 October 2013. Retrieved 19 July 2013. ^ Andrew Skelly (Aug 3, 2010). "CT ordering all over the map". The Medical Post. ^ Korley FK, Pham JC, Kirsch TD (October 2010). "Use of advanced radiology during visits to US emergency departments for injury-related conditions, 1998–2007". JAMA. 304 (13): 1465–71. doi:10.1001/jama.2010.1408. PMID 20924012. ^ Goldman, L. W. (2008). "Principles of CT: Multislice CT". Journal of Nuclear Medicine Technology. 36 (2): 57–68. doi:10.2967/jnmt.107.044826. ISSN 0091-4916. PMID 18483143. ^ a b Fishman, Elliot K.; Ney, Derek R.; Heath, David G.; Corl, Frank M.; Horton, Karen M.; Johnson, Pamela T. (2006). "Volume Rendering versus Maximum Intensity Projection in CT Angiography: What Works Best, When, and Why". RadioGraphics. 26 (3): 905–922. doi:10.1148/rg.263055186. ISSN 0271-5333. PMID 16702462. ^ Silverstein, Jonathan C.; Parsad, Nigel M.; Tsirline, Victor (2008). "Automatic perceptual color map generation for realistic volume visualization". Journal of Biomedical Informatics. 41 (6): 927–935. doi:10.1016/j.jbi.2008.02.008. ISSN 1532-0464. PMC 2651027. PMID 18430609. ^ Page 185 Leif Kobbelt (2006). Vision, Modeling, and Visualization 2006: Proceedings, November 22-24. IOS Press. ISBN 9783898380812. ^ Brant and Helms' fundamentals of diagnostic radiology (Fifth ed.). Lippincott Williams & Wilkins. 2018-07-19. p. 1600. ISBN 9781496367389. Retrieved 24 January 2019. ^ Dalrymple, Neal C.; Prasad, Srinivasa R.; Freckleton, Michael W.; Chintapalli, Kedar N. (September 2005). "Informatics in radiology (infoRAD): introduction to the language of three-dimensional imaging with multidetector CT". Radiographics: A Review Publication of the Radiological Society of North America, Inc. 25 (5): 1409–1428. doi:10.1148/rg.255055044. ISSN 1527-1323. PMID 16160120. ^ Bhowmik, Ujjal Kumar; Zafar Iqbal, M.; Adhami, Reza R. (28 May 2012). "Mitigating motion artifacts in FDK based 3D Cone-beam Brain Imaging System using markers". Central European Journal of Engineering. 2 (3): 369–382. Bibcode:2012CEJE....2..369B. doi:10.2478/s13531-012-0011-7. ^ a b P. Jin; C. A. Bouman; K. D. Sauer (2013). "A Method for Simultaneous Image Reconstruction and Beam Hardening Correction" (PDF). IEEE Nuclear Science Symp. & Medical Imaging Conf., Seoul, Korea, 2013. Archived (PDF) from the original on 2014-06-06. ^ Boas FE, Fleischmann D (2011). "Evaluation of Two Iterative Techniques for Reducing Metal Artifacts in Computed Tomography". Radiology. 259 (3): 894–902. doi:10.1148/radiol.11101782. PMID 21357521. Archived from the original on 2011-12-01. ^ Mouton, A.; Megherbi, N.; Van Slambrouck, K.; Nuyts, J.; Breckon, T.P. (2013). "An Experimental Survey of Metal Artefact Reduction in Computed Tomography" (PDF). Journal of X-Ray Science and Technology. 21 (2): 193–226. doi:10.3233/XST-130372. PMID 23694911. ^ Pessis, Eric; Campagna, Raphaël; Sverzut, Jean-Michel; Bach, Fabienne; Rodallec, Mathieu; Guerini, Henri; Feydy, Antoine; Drapé, Jean-Luc (2013). "Virtual Monochromatic Spectral Imaging with Fast Kilovoltage Switching: Reduction of Metal Artifacts at CT". RadioGraphics. 33 (2): 573–583. doi:10.1148/rg.332125124. ISSN 0271-5333. PMID 23479714. ^ a b Jha, Diwaker (2014). "Adaptive center determination for effective suppression of ring artifacts in tomography images". Applied Physics Letters. 105 (14): 143107. Bibcode:2014ApPhL.105n3107J. doi:10.1063/1.4897441. ^ Van Nieuwenhove, V; De Beenhouwer, J; De Carlo, F; Mancini, L; Marone, F; Sijbers, J (2015). "Dynamic intensity normalization using eigen flat fields in X-ray imaging" (PDF). Optics Express. 23 (21): 27975–27989. Bibcode:2015OExpr..2327975V. doi:10.1364/oe.23.027975. PMID 26480456. ^ Sijbers J, Postnov A (2004). "Reduction of ring artefacts in high resolution micro-CT reconstructions". Phys Med Biol. 49 (49(14)): N247–53. doi:10.1088/0031-9155/49/14/N06. PMID 15357205. ^ Van de Casteele E, Van Dyck D, Sijbers J, Raman E (2004). "A model-based correction method for beam hardening artefacts in X-ray microtomography". Journal of X-ray Science and Technology. 12 (1): 43–57. CiteSeerX 10.1.1.460.6487. ^ Van Gompel G, Van Slambrouck K, Defrise M, Batenburg KJ, Sijbers J, Nuyts J (2011). "Iterative correction of beam hardening artifacts in CT". Medical Physics. 38 (1): 36–49. Bibcode:2011MedPh..38S..36V. CiteSeerX 10.1.1.464.3547. doi:10.1118/1.3577758. PMID 21978116. ^ R. A. Crowther; D. J. DeRosier; A. Klug (1970). "The Reconstruction of a Three-Dimensional Structure from Projections and its Application to Electron Microscopy". Proc. Roy. Soc. Lond. A. 317 (1530): 319–340. doi:10.1098/rspa.1970.0119. ^ Barkan, O; Weill, J; Averbuch, A; Dekel, S. "Adaptive Compressed Tomography Sensing" Archived 2016-03-13 at the Wayback Machine. In Proceedings of the IEEE Conference on Computer Vision and Pattern Recognition 2013 (pp. 2195–2202). ^ Simpson G (2009). "Thoracic computed tomography: principles and practice". Australian Prescriber. 32 (4): 4. doi:10.18773/austprescr.2009.049. ^ Evans, Ll. M.; Margetts, L.; Casalegno, V.; Lever, L. M.; Bushell, J.; Lowe, T.; Wallwork, A.; Young, P.; Lindemann, A. (2015-05-28). "Transient thermal finite element analysis of CFC–Cu ITER monoblock using X-ray tomography data". Fusion Engineering and Design. 100: 100–111. doi:10.1016/j.fusengdes.2015.04.048. Archived from the original on 2015-10-16. ^ Payne, Emma Marie (2012). "Imaging Techniques in Conservation". Journal of Conservation and Museum Studies. 10 (2): 17–29. doi:10.5334/jcms.1021201. ^ P. Babaheidarian; D. Castanon (2018). "Joint reconstruction and material classification in spectral CT". Anomaly Detection and Imaging with X-Rays (ADIX) III. p. 12. doi:10.1117/12.2309663. ISBN 9781510617759. ^ P. Jin; E. Haneda; K. D. Sauer; C. A. Bouman (June 2012). "A model-based 3D multi-slice helical CT reconstruction algorithm for transportation security application" (PDF). Second International Conference on Image Formation in X-Ray Computed Tomography. Archived (PDF) from the original on 2015-04-11. ^ P. Jin; E. Haneda; C. A. Bouman (November 2012). "Implicit Gibbs prior models for tomographic reconstruction" (PDF). Signals, Systems and Computers (ASILOMAR), 2012 Conference Record of the Forty Sixth Asilomar Conference on. IEEE. pp. 613–636. Archived (PDF) from the original on 2015-04-11. ^ S. J. Kisner; P. Jin; C. A. Bouman; K. D. Sauer; W. Garms; T. Gable; S. Oh; M. Merzbacher; S. Skatter (October 2013). "Innovative data weighting for iterative reconstruction in a helical CT security baggage scanner" (PDF). Security Technology (ICCST), 2013 47th International Carnahan Conference on. IEEE. Archived (PDF) from the original on 2015-04-10. ^ Megherbi, N.; Flitton, G.T. ; Breckon, T.P. (September 2010). "A Classifier based Approach for the Detection of Potential Threats in CT based Baggage Screening" (PDF). Proc. International Conference on Image Processing. IEEE. pp. 1833–1836. CiteSeerX 10.1.1.188.5206. doi:10.1109/ICIP.2010.5653676. ISBN 978-1-4244-7992-4. Retrieved 5 November 2013. ^ Megherbi, N.; Han, J.; Flitton, G.T. ; Breckon, T.P. (September 2012). "A Comparison of Classification Approaches for Threat Detection in CT based Baggage Screening" (PDF). Proc. International Conference on Image Processing. IEEE. pp. 3109–3112. CiteSeerX 10.1.1.391.2695. doi:10.1109/ICIP.2012.6467558. ISBN 978-1-4673-2533-2. Retrieved 5 November 2013. ^ Flitton, G.T. ; Breckon, T.P. ; Megherbi, N. (September 2013). "A Comparison of 3D Interest Point Descriptors with Application to Airport Baggage Object Detection in Complex CT Imagery" (PDF). Pattern Recognition. 46 (9): 2420–2436. doi:10.1016/j.patcog.2013.02.008. Retrieved 5 November 2013. ^ Radon J (1917). "Uber die Bestimmung von Funktionen durch ihre Integralwerte Langs Gewisser Mannigfaltigkeiten" [On the determination of functions from their integrals along certain manifolds]. Ber. Saechsische Akad. Wiss. 29: 262. ^ Radon J (1 December 1986). "On the determination of functions from their integral values along certain manifolds". IEEE Transactions on Medical Imaging. 5 (4): 170–176. doi:10.1109/TMI.1986.4307775. PMID 18244009. ^ Oldendorf WH (1978). "The quest for an image of brain: a brief historical and technical review of brain imaging techniques". Neurology. 28 (6): 517–33. doi:10.1212/wnl.28.6.517. PMID 306588. ^ Richmond, Caroline (2004). "Obituary – Sir Godfrey Hounsfield". BMJ. 329 (7467): 687. doi:10.1136/bmj.329.7467.687. PMC 517662. ^ Edholm, Paul; Gabor, Herman (December 1987). "Linograms in Image Reconstruction from Projections". IEEE Transactions on Medical Imaging. MI-6 (4): 301–7. doi:10.1109/tmi.1987.4307847. PMID 18244038. ^ Retsky, Michael (31 July 2008). "Electron beam computed tomography: Challenges and opportunities". Physics Procedia. 1 (1): 149–154. Bibcode:2008PhPro...1..149R. doi:10.1016/j.phpro.2008.07.090. ^ Jenkins, Ron; Gould, R W; Gedcke, Dale (1995). "Instrumentation". Quantitative x-ray spectrometry (2nd ed.). New York: Dekker. p. 90. ISBN 9780824795542. ^ Shikhaliev, Polad M.; Xu, Tong; Molloi, Sabee (2005). "Photon counting computed tomography: Concept and initial results". Medical Physics. 32 (2): 427–36. Bibcode:2005MedPh..32..427S. doi:10.1118/1.1854779. PMID 15789589. ^ Taguchi, Katsuyuki; Iwanczyk, Jan S. (2013). "Vision 20∕20: Single photon counting x-ray detectors in medical imaging". Medical Physics. 40 (10): 100901. Bibcode:2013MedPh..40j0901T. doi:10.1118/1.4820371. PMC 3786515. PMID 24089889. ^ "NIH uses photon-counting CT scanner in patients for the first time". National Institutes of Health. 24 February 2016. Archived from the original on 18 August 2016. Retrieved 28 July 2016. ^ "Photon-counting breast CT measures up". medicalphysicsweb. Archived from the original on 2016-07-27. Retrieved 28 July 2016. Wikimedia Commons has media related to Computed tomography. Filler, Aaron (12 July 2009). "The History, Development and Impact of Computed Imaging in Neurological Diagnosis and Neurosurgery: CT, MRI, and DTI". Nature Precedings. doi:10.1038/npre.2009.3267.5.